One of the myths and misconceptions out there is that you need an expensive tamper to pull good espresso shots. This couldn’t be further from the truth. An espresso tamper serves one main purpose, which is tamping or compacting the coffee tightly together as to ensure proper and even flow of water throughout the puck. Now, the most important feature of a tamper to ensure a quality tamp, is the base size. Water is lazy and it will always take the path of least resistant. A smaller diameter tamper, will only tamp part of the coffee but not all of it. 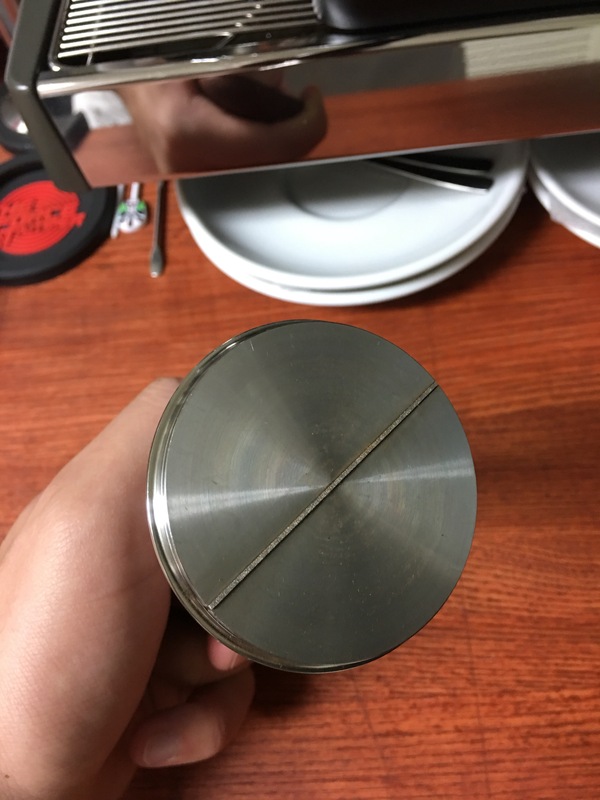 This will cause the coffee that was tamped to be overextracted while the ring of coffee that was not tamped (due to the smaller diameter tamper base) to be underextracted. The mix of underextraction and overextraction will cause the flavor to be off. 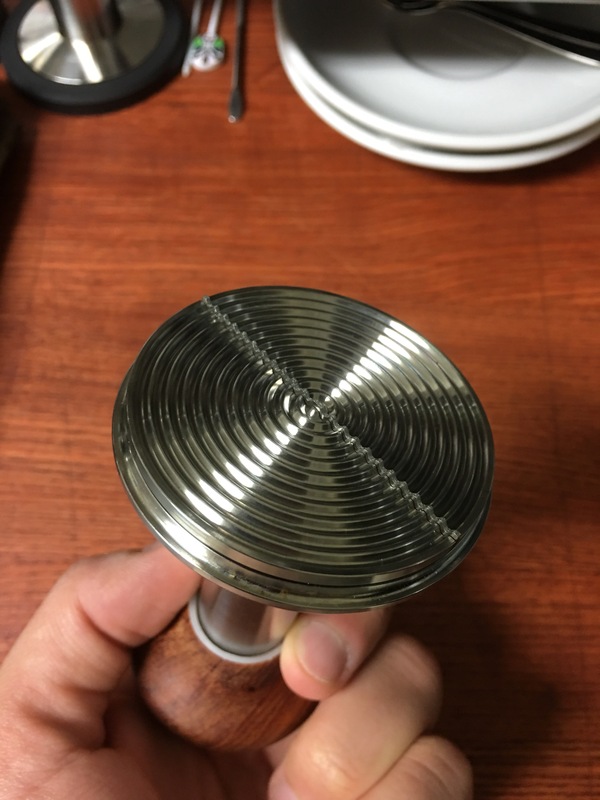 For under $30 you can find a perfect size tamper, depending on the size of your basket, that will last you a lifetime and will do the job perfectly (assuming you have the proper tamping technique down). Many people believe that tamper weight is very important and they seek heavier tampers made out of stainless, metal, etc. but I personally disagree with that. As explained earlier, the size of the tamper is the most important feature of a tamper, weight is merely a preference as some people prefer a certain heft in their hand while tamping. Having said that, there is a case to be made for lighter tampers but that’s a different conversation for another day. Having said that, many people will spend $200 on tampers, which is perfectly fine, but keep in mind that many of those tampers serve and do the same job the $30 tamper does. The main difference is that the $200 tamper most likely has a handle made out of fancy wood or exquisite materials with unmistakable craftsmanship (and other cosmetic attributes) while the $30 tamper is made out of metal or other plain more modest materials. The $200 tamper is most likely beautiful to look at but that’s about it. There is one exception to this however, some tampers that do cost $150 or more actually do a lot more than simply ensure a full tamp of the coffee puck. Tampers such as The Force Tamper, Bravo Tamper, Espro Calibrated Tamper etc. also ensure a perfectly leveled tamp as they sit on top of the basket ensuring that when the tamper base comes in contact with the coffee, it is fully leveled, this ensures that the water is (by sliding to the lower side of the puck) not going to prefer one side over the other. A sloping, uneven tamp can be seen from a bottomless portafilter if the coffee stream/cone is off center and can also be seen if using a double spout portafilter and coffee is coming out of one side of the spout more than the other. The Force Tamper will even go a step further than most tampers by applying the same tamping force, regardless of dose. This convenient feature is nice to have if you change dosage or coffees as you won’t need to adjust the travel distance of the tamper to ensure proper pressure. To summarize, an expensive tamper won’t do a better job than a cheaper one if both tampers are appropriately sized for the coffee basket. The only time a more expensive tamper will do a better job if it can ensure a leveled tamp (by sitting on top of the coffee basket) and/or if it can ensure a consistent tamping pressure/force, shot after shot. For this week’s post, I wanted to compare two different coffee distribution tools, The Force Tamper distribution tool vs the OCD knockoff distribution tool. Both tools are supposed to achieve the same thing, which is distribute the coffee grounds evenly in the portafilter basket, albeit using different methods. The OCD knockoff is using three fins that are slightly angled as to push (distribute) the coffee around as you twist the tool. The Force Tamper built-in distribution tool uses a metal bar that sits on what appears to be tiny springs. The base’s weight sits on the coffee grounds and when you start twisting the tamper/base the metal bar starts pushing the coffee around to also distribute the coffee and the springs that the bar is sitting on ensures that it adapts to coffee bumps or any unevenness in the basket, the same way a car’s suspension adapts to road unevenness. For the purpose of this comparison, I have chosen to pull 2 shots, one using the OCD knockoff distribution tool and the other using The Force Tamper built-in distribution tool. The only variable here is the distribution tool. Both shots were pulled using the same coffee (Kimbo Superior Blend), same grinder (Mazzer Super Jolly), same espresso machine (Nuova Simonelli Musica), same cooling flush duration (5 to 6 seconds after flash boiling), same basket (VST 20gm) and even same tamper (The Force Tamper, one with base that has the built-in distribution tool and the other with a flat base without the built-in distribution tool). The results were interesting, the shot pulled with The Force Tamper built-in distribution tool looked nicer and a little less bitter. Below is a side by side comparison of both shots 10 seconds after the first drop of coffee appeared from the basket. To be totally fair, the less bitter taste could have been the result of a little longer cooling flush before I pulled the second shot but it could also be the result of a better distribution, as shown in the side by side pictures above. Visually better extraction (taste difference is negligible but definitely better distribution). Tool costs under $30 and can be easily retrofitted to your existing The Force Tamper. The OCD knockoff costs around the same, although it can be used with your existing tamper but with less than ideal results. More streamlined workflow as there is no need to switch between tools. Unlike the OCD knockoff distribution tool, The Force Tamper does not need to have the depth of the fins adjusted (manually or by adding shims) every time you change dose or coffee, as it adapts to the height of the coffee bed. The input is 17g of coffee and the output is around 32g to 34g of liquid. Distribution evenness was maintained by using the WDT distribution technique (paper clip to distribute/agitate the coffee grounds in the basket) and a Chinese knockoff distribution tool similar to the OCD. The following are pictures showing the shots 10 seconds from the moment the first drop of liquid appeared from the basket. This will give a basis for comparison that’s pretty consistent. Looking at the pictures, I seem to think that the Ripple and Flat bases have performed best. Taste wise, I haven’t noticed any major difference, except that the shot extracted using the Curve base tasted unbalanced and the shot extracted using the Flat base tasted the most balanced. Please note that these tasting notes are based on my palette, others may be able to detect much deeper differences and complicated notes that I may have not tasted. I personally use a flat base as I find it to be the easiest to work with and the most consistent but others have found other base shapes to be best for their coffees, use or machines. You can also watch the video below for the full extractions and feel free to leave me comments with any questions or suggestions you may have. Couple of months ago, Zubing Sun, the owner and inventor of The Force Tamper posted a video on Instagram demoing a tamper base (for The Force Tamper) that can distribute the grounds inside the basket before tamping, needless to say I was intrigued and impressed. Zubing graciously sent me couple of units for review along with a clear glass basket so that I’m able to see in action the distribution done by the new base. As pictured below, the base has a thin metal bar going across the diameter of the base Zubing sent me one flat and one ripple base. This thin metal bar moves up and down as needed and depending on the amount of coffee in the basket. The way it works, you sit your The Force Tamper on the basket like you would do for tamping, except instead of pressing down right away you let the weight of the Tamper sink inside the basket and then you rotate the tamper handle few times at either direction (clockwise or counterclockwise). 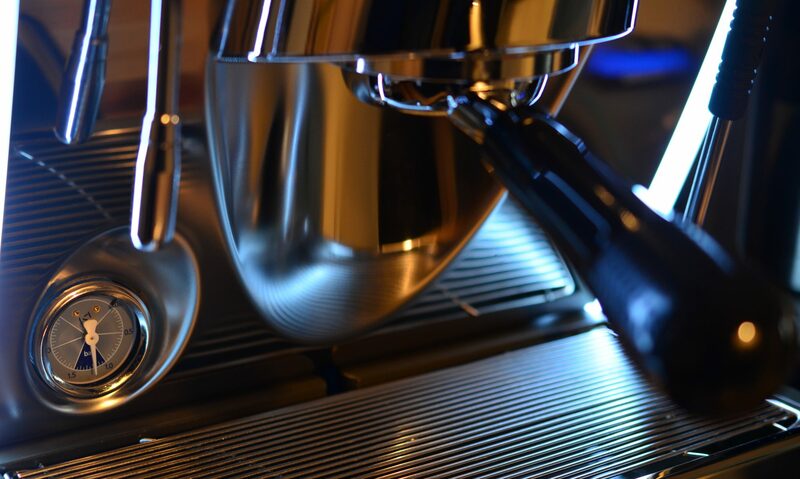 This motion leverages the metal bar that’s built in the base to sweep or distribute the coffee. Here’s another video showing the distributor tool in action, using a clear basket that was designed to showcase the distribution action. No need for a separate tool. Distribution and tamping can now be done using one tool and that’s The Force Tamper. No need to adjust the depth of the distribution tool. If you have owned a distribution tool, you know that every time you change dosing or coffee you will need to manually adjust the depth of the blade of the distribution tool to get a flat, even puck with no holes or irregularities. Since the distribution done by the base relies on the weight of the tamper, there are no adjustments needed. The price. For $29 you get a base for tamping and a distribution tool. This price is unbeatable on the market as the cheapest distribution tool out there cost more than $80. Even the Chinese knockoffs of the OCD distribution tools cost more than $40. Overall, I’m very happy with the new distribution base for The Force Tamper. It does the job effectively and efficiently while saving you some cash in the process.